This past episode of Monday Night RAW was the last one before WrestleMania 35. Kurt Angle announced a few weeks back that he will be fighting his career last match at World Wrestling Entertainment (WWE) grandest event WrestleMania. As Angle walked out the ramp with the intention to face Rey Mysterio, he was instead greeted with a tribute video, which left Angle speechless. Angle made his final appearance of RAW this past week. WWE Raw April 1, 2019 Results: Brawl Between Ronda Rousey, Charlotte Flair and Becky Lynch Ends With Them Getting Arrested Before Wrestlemania 35 (Watch Video). 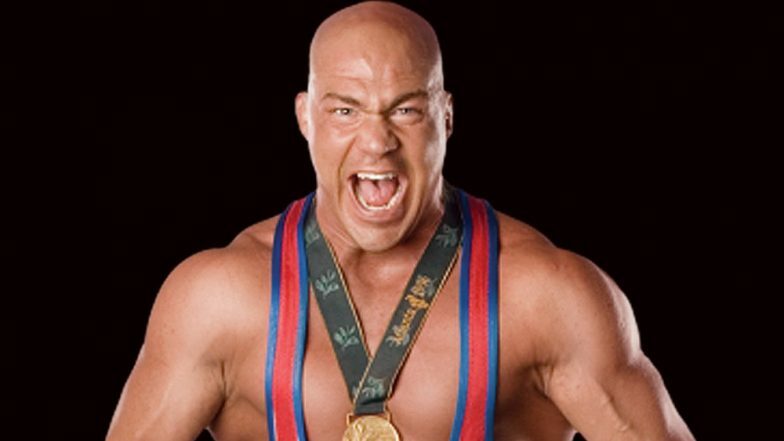 Kurt Angle is the Olympic Gold medalist, as he has won a gold medal in freestyle wrestling at 1996 Summer Olympics. Angle signed a contract with WWE in the year 1998. Kurt Angle has also wrestled in other wrestling promotion like Total Non-Stop Action (TNA) and New Japan Pro Wrestling. Throughout his wrestling career, Kurt has held a total of 21 championship belts. He is the only pro-wrestler in history to have won the WWE Championship, WWE's World Heavyweight Championship, the WCW Championship, the TNA World Heavyweight Championship and the IGF's IWGP Heavyweight Championship. Kurt Angle will face Baron Corbin in his farewell match at WrestleMania 35. Fans expected WWE to book his farewell match against Kurt Angle, to give a proper exit to his career. John Cena made debut against Kurt Angle in an episode of WWE SmackDown in the year 2002. WrestleMania 35 will take place on April 7, 2019 at Metlife Stadium, East Rutherford, New Jersey. WrestleMania is the flagship event of WWE. This Sunday we expect to witness one of the best WrestleMania of all times. For the first time ever in the history of WrestleMania, WWE Women's Championship match will be kept as the main event. This women's title match will feature current WWE Raw Women's champion Ronda Rousey, Becky Lynch and WWE SmackDown Women's champion Charlotte Flair. The winner of this triple-threat match will walk out with both the women championship title belts.